There are fashion designers and then there is Rei Kawakubo, occupying a space all of her own: a space filled with power, emotion, fearlessness and even love. She is both mythical – an inspiration to every generation that comes after her – and a sorceress, working her magic in the creation of ever more extraordinary garments (to use the word loosely). How apt, then, that her latest offering was a meditation on « blue witches ». Every season, those privileged enough to witness her collections are given one or maybe two words to describe them and that is what she said. She likes her audience to come up with their own interpretation of her show and these gnomic statements only serve to fuel that fire. In fact, this is not the first time she has explored the subject. In this designer’s eyes, witches are strong women, often misunderstood, who use their force for the greater good. The fact that she clearly identifies with them is poetic but not surprising. Rei’s blue witches appeared preternaturally in tune with the elements, the natural, the supernatural, the mystic… And it says quite something that such grand themes were explored and evoked in the Comme des Garçons S/S16 collection – within only 16 looks. What magnificent looks they were. Crafted principally in faux fur, from astrakhan to leopard, they sprouted tubular extremities, and were so huge that models’ slender frames were dwarfed by them. What looked like wet – or possibly oil damaged? – feathers enfolded narrow torsos. Huge cotton ruffles wound their way round circular structures, and even huger crossover straps gathered garments to the body from behind. The pointed toes of shoes – flat and in black patent leather – were directed to the heavens. Plasticized wigs, as big and fluffy as passing clouds, only added to the monumental nature of it all. The designer’s brief to Julien d’Ys, long responsible for the hair and make up of the house, was simply « red » – and how brilliantly that worked. 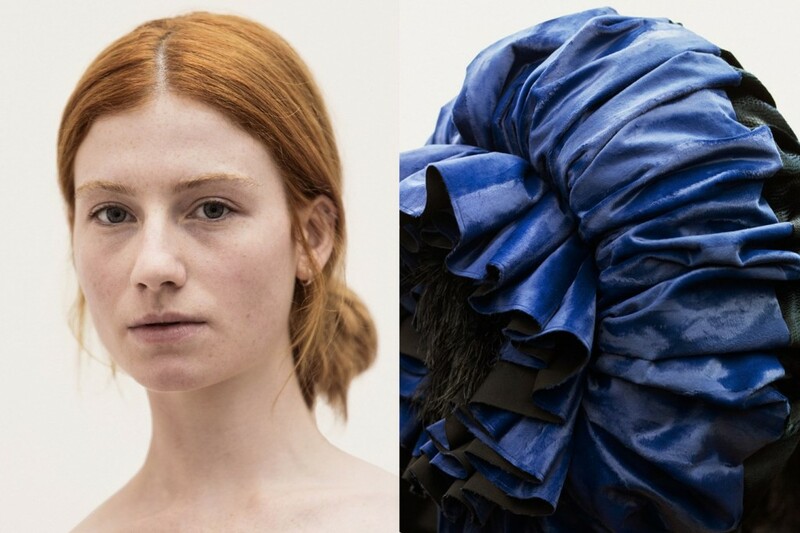 The original swatches of faux fur, sourced in a factory specialising in the material in Spain, just happened to be blue, and Kawakubo fell in love with them. She then started thinking about Blue Velvet, David Lynch, and Isabella Rossellini – and about how such a beautiful woman ended up central to an intrinsically evil world. That brings us to the soundtrack, put together by Frederic Sanchez the day before the show. Call it (almost unbelievable) coincidence, or just witchcraft, but the music he brought with him was the yet to be released Blue Velvet Revisited, an album of tracks by young musicians all inspired by the film. From romantic, classical interpretations, to strangely unsettling animalistic sounds, it couldn’t have been more perfect. The music then moved on to Julee Cruise’s mesmerising Mysteries Of Love, and then ultimately to Rossellini’s performance of the film’s eponymous song. Like Shakespeare’s fool, that final unashamedly nostalgic gesture released the tension, bringing a smile to the lips of all in attendance. Five seasons ago now, there was a revolution at Comme des Garçons. The woman behind it all made the unprecedented decision that she would no longer set out to make clothes for the runway and that, instead, her women’s ready-to-wear presentations would work more as an exhibition – from which a full collection (on display in the label’s Place Vendôme showroom for the days following the show) would spring. And so, here were presented fuzzy blue velvet separates, the black tailoring that the name is known and loved for, knitwear, bags, footwear inspired, as it always has been, by the masculine wardrobe all of which will go on sale in Comme des Garçons stores and in Dover Street Market – a retail concept transformative in its own right – six months from now. The catwalk looks themselves sell for five-figure sums and are bought mainly by collectors. It is surely significant that the venue of choice this time around was the loud, proud Le Centorial (headquarters to financial powerhous Credit Lyonnais). However Rei Kawakubo presented her collection not in the splendid upper storeys of the building, where other designers have shown in the past, but in its depths – the smallest, most humble space available, and with exposed piping overhead. The plywood runway was so narrow that models struggled to pass each other and the audience could – and in at least some cases did – reach out and touch the clothes. The symbolism of this location alone – and its relationship to a woman behind a multi-million dollar name who, after more than 45 years in the industry, remains at the height of her creative power – needs no explaining. Magic.